Roasted maya-maya or red snapper is a simple yet elegant dish. The wine and lemon adds continental flavor to the dish. This is a low calorie dish and loaded with vitamins and minerals because the fish is combined with vegetables like bell pepper, potatoes and carrots. It is also roasted in an oven and not fried so that you can really taste the flavor. 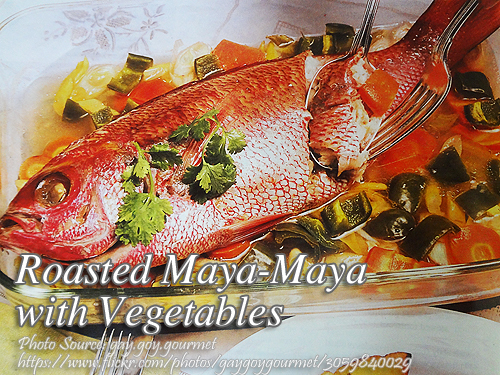 To cook roasted maya-maya with vegetables; Preheat oven to 275 °F. In a large roasting pan combine 1/4 cup of the olive oil with potatoes. Season with salt and pepper and roast potatoes for about 30 minutes. Stir in bell peppers, carrots, leeks and wine. Toss gently avoid breaking the potatoes. Rub fish with salt, lemon juice and remaining oil. Arrange on top of vegetables. Return to oven and roast 30 – 35 minutes or until fish is cooked through. Let fish stand for 10 minutes. Drizzle with the pan juices before serving. To see the complete recipe, continue reading. Hi, I made this today and 275 for 30 minutes is not enough for the fish to cooked. Had to make 375 for additional 10 – 15 minutes.